Although only drinking water for 2 or 3 days can have its benefits, water fasting may not be for everyone. There can be dangers associated with water fasting if you are underweight, pregnant, or have underlying health conditions. However, if you want to lose weight, a water fast can kick-start your diet. In this article, you will learn about the benefits of water fasting and how to water fast safely. You will also find out what to do before and after water-only fasting to get the most benefits from it. Water fasting is when you don’t consume anything but water for a set period of time. A water fast can last for as short as 24 hours or last as long as 5 or 7 days. Some people like to add lemon juice, cayenne pepper, and honey to their water fasting. One of the popular water fasting methods is the lemon detox cleanse. Other popular water fasting recipes include adding cucumber, watermelon, or ginger to the water. What are the Possible Benefits of a Water Fast? Fasting every so often for 1 or 2 days by drinking only water can help to stimulate your metabolism and regenerate your cells. Is Water Fasting Bad or Good for You? Water fasting is good for most people when done safely. According to doctors from WebMD, fasting is not good for children, pregnant women, some diabetes conditions, and if you have an eating disorder. (8) Also people with other health conditions shouldn’t do water fasting without consulting first with their doctor. 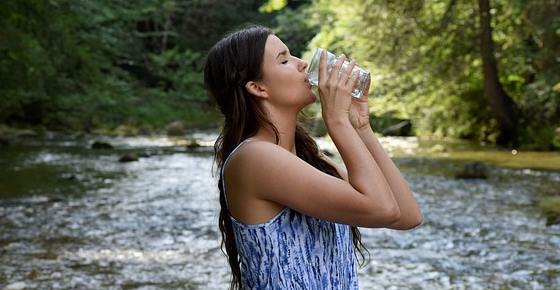 Are there any dangers associated with a 2 or 3-day water fast? However anyone who water fasts for extended periods (more than 3 days) or have medical condition should do it only under close medical supervision. There are no specific guidelines on how to fast with a water diet, apart from only drinking water. During a 24-hour water fast you should aim to drink between 2 and 3 liters of water. This means you should drink a glass of water every hour or so. Usually, a water fast lasts between 1 and 3 days for best results. If you want to fast safely for longer, it is important to consult with your doctor. Water fast diets that last between 4 and 7 days may not be suitable for everyone. To get the most benefits from fasting on a water diet, it is important to prepare your body for the fast. For example, you should eat the right foods before and after the water fast. This can help to prevent some of the side effects that a few people experience on water fasting. It is also important to break your fast correctly to prevent weight gain and to keep your body in ketosis after the fast. Before starting a water fast, you should eat the right foods so that your body better adjusts to only consuming water. Before the water fasting you should also eliminate alcohol and caffeine from your diet. Also, try to cut down on sugary foods and beverages. This will help to reduce any adverse reaction from only drinking water for 2 or 3 days. If you are planning an extended fast of 4, 5, or 7 days, then it’s also a good idea to try and reduce stress as much as possible before and during your fast. One of the biggest mistakes to make after a water fast is to eat a large, calorie-laden meal. During an extended fast, your body goes into ketosis. This means that your body uses fat and ketones rather than glucose (sugar) as its main energy source and. If you break your fast gently, it should be possible for a short time to stay in ketosis after water fasting. Water fasting that lasts 2 or 3 days can be challenging, especially if you have never done a water fast before. So, if you are new to water fasting, then trying a 1-day water fast will help you know what to expect. Let’s look in more detail at the many benefits of enjoying a 24, 36, or 48-hour water fast. One of the reasons why fasting is good for your body is that it promotes autophagy. Various studies have linked autophagy to the prevention of certain chronic diseases. Some of the most noticeable effects of water fasting are lower body weight, less belly fat, and a slimmer waistline. Another type of fasting that can help you lose weight is intermittent fasting, or, the 5:2 diet. Learn more about the health benefits of intermittent fasting. As well as fasting for 2 or 3 days occasionally to lose weight, find out about other great tweaks for losing weight fast. One of the benefits of water fasting is to help manage hypertension. Learn about other lifestyle choices you can make to help manage hypertensive conditions. Regularly having a diet for a few days of water only and no food can also help protect against serious diseases. Having a water-only diet for a day or two can also help to protect your cognitive function. As well as helping lower your risk of chronic disease, fasting may help you live longer. The positive effect fasting has on your body, in general, can help to strengthen your immunity.